The saying goes ‘you eat with your eyes’ and this is very true of the bright Scarlet Elf Cup. This stunning little fungus is the perfect ingredient to surprise your guests and create simple, yet mouth-watering hors d’oeuvres full of colour contrast. They can make the perfect gourmet woodland snack because the ‘basket shape’ allows to fill them with other hedgerow edibles in season. Think of wood sorrel, wild garlic, velvet shank, pink purslane, three cornered leek or hairy bitter cress for instance. Please note general advice is to cook all wild mushrooms. Take a nibble first to make sure it agrees your body. You just need to combine carefully all your ingredients; that could include leaves, nuts, berries or fungi. I have used the ingredients available at this moment of the year, including part of the hazelnuts I harvested in autumn. It is always better to keep it simple. 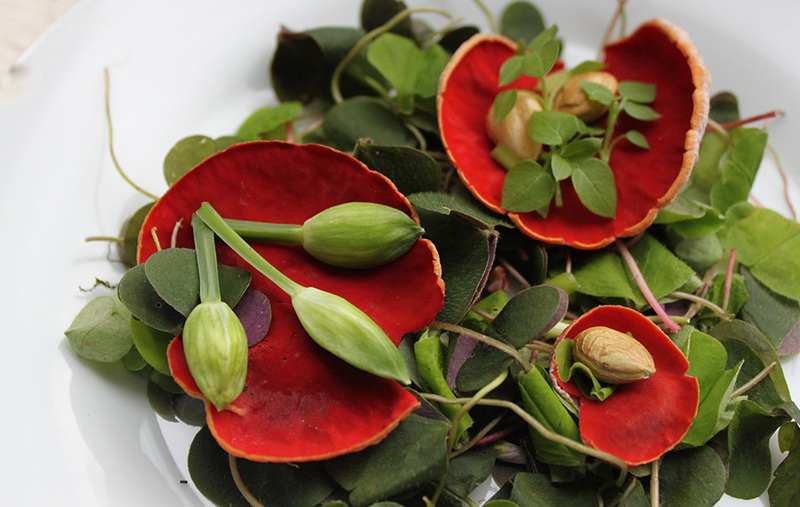 Everything is served in a lemony wood sorrel bed. This is the true taste of early spring woodland!